It was late evening at the small community airport where my mother and I were waiting for my father to return from his flight. I was left waiting on a little bench, lounging in the tepid spring evening, reading a new copy of Electronic Gaming Monthly, which Mother very occasionally purchased for me at newsstands. I flipped through the pages idly and suddenly came upon a two page spread. It said just that, "BOOM". Big pink, italic letters. Running in front of the word was a large blue hedgehog with spikes. That was the first news I had of Sonic The Hedgehog, the character with whom I have enjoyed perhaps the most intense, chaotic relationship of any in video games. Fitting for the collector of the Chaos Emeralds. I showed the magazine spread to my mother. "Look at this," I said. "I want this." "But honey, it's on the Sega Genesis. You don't have a Sega Genesis. I'm NOT buying you a Sega." "I don't WANT a Sega," I said. Then, as now, I was a loyal Nintendo fan, and I did not like Sega for their aggressive attacking of Nintendo. "I just want Sonic. I want to keep watching him." I had just turned ten. Eventually, June 23, 1991 rolled around, and Sonic The Hedgehog saw its release to much fanfare. It was not long before I had the opportunity to play the game for myself. Our neighborhood had another family with two boys; they were close friends of my brother and I since before I could remember. In my eyes, that family had everything: they had a Nintendo Entertainment System early on, they had a Sega Master System... and they also got a Sega Genesis shortly after it was released. So, naturally, they got Sonic The Hedgehog. Even at first glance, Sonic The Hedgehog was a very impressive game. The speed was a draw, to be sure, but the game was also colorful and well-designed. The blue hedgehog, created by 大島直人 (Naoto Ooshima) during an in-house design competition at Sega, was on the fast track to becoming the company's official mascot—ousting hapless Alex Kidd, the pointy-eared boy who was previously in line to represent the company. The game was fun; it looked good, played well, and had plenty of secrets. What really got me, however, was the music. The tunes in Sonic The Hedgehog struck me as being a cut above the usual fare, particularly on the Sega Genesis. As I would learn later, the man behind the game's music was no ordinary composer. 中村正人 (Masato Nakamura), who wrote the music for the first two Sonic games on the Sega Genesis, is a member of the Japanese music group Dreams Come True, which is still active in Japan today. As is often the case, the music held me. I found myself loitering in the Marble Zone just to hear the stage's melody. It's good that the music was so spectacular: had it not been, I may not have become so attached to Sonic. The game's frequent booby traps and the fact that you could die instantly by being crushed, along with the fact that it was very difficult to control Sonic accurately while he was running, made it hard for me to get involved in a game that I didn't own. Nonetheless, the game had its charm. Sonic The Hedgehog is a brilliant character, and I quickly became fond of him. I even began to buy Sega magazines so that I could read about him (including a strange origins comic in Sega Force). Sonic also had a phenomenal nemesis in Dr. Robotnik (now known as Dr. Eggman, his Japanese name), a rotund scientist, modeled as a parody of Theodore Roosevelt. Not having made the cut as the game's hero, Robotnik was made to play the role of antagonist, something that he has done exceedingly well for nearly twenty years. The good doctor and his various schemes to rule the world have gotten progressively more complex as the series has evolved, and his tendency to even occasionally ally himself with Sonic for a greater cause has made him one of the most versatile villians in video gaming, perhaps second only to the king of all nemeses, the great King Koopa himself. One winter afternoon, after playing Sonic The Hedgehog at one acquaintance's house, I arrived home to find that the snowy day had left its mark upon the land. The snow was piled high, and on top of it was a layer of ice, strong enough to stand on. I stayed outside for hours, sliding around on my feet on that ice, pretending that I was Sonic in the Spring Yard Zone. I was on the lawn until well after dark. Snowy winters remind me of many things, but, even now, a heavy snow topped with a sheet of ice always reminds me very strongly of Sonic The Hedgehog. And no, by the way, my capitalization of "The" is not an error: As the story goes, when Sega registered Sonic as a trademark, they found that his name was not copyrightable. Unless, that is, they registered his whole name as "Sonic The Hedgehog", with "The" as part of the character's middle name. Many later additions to the cast followed the same pattern, with one notable exception. Sonic was popular in Japan, but his reception in the United States was far beyond anything that Sega had expected. And, accordingly, the second game was developed by a Japanese team located stateside. The major addition in Sonic The Hedgehog 2 completely captured my attention: a little orange fox named Miles "Tails" Prower. 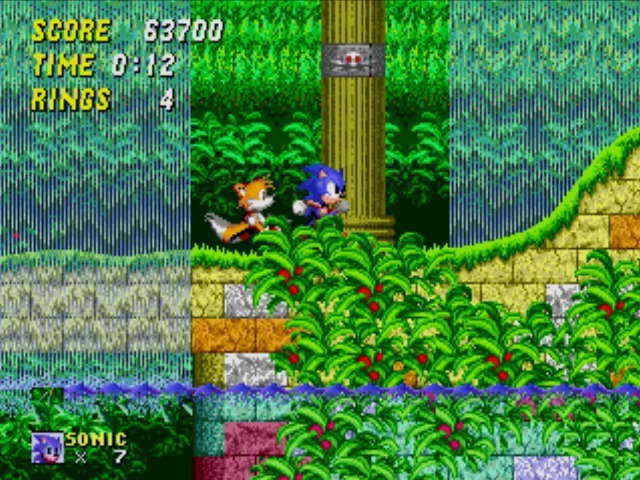 Nickamed "Tails" due to his having two of them, the little fox followed Sonic wherever he went, tagging along through all of the game's levels. Tails' real name, Miles, almost didn't make the cut for inclusion in the game: as the story goes, Tails' designer, Yasushi Yamaguchi, was adamant about naming his creation "Miles", but the producer wasn't having it. Dismissed and overruled, the designer (who was also in charge of backgrounds), snuck Miles' name into the backdrops of various levels. Once the insertion was discovered, it was too late to have the stages redone, and so a compromise was made. Miles Prower would retain his given name, but would be given the nickname of "Tails". 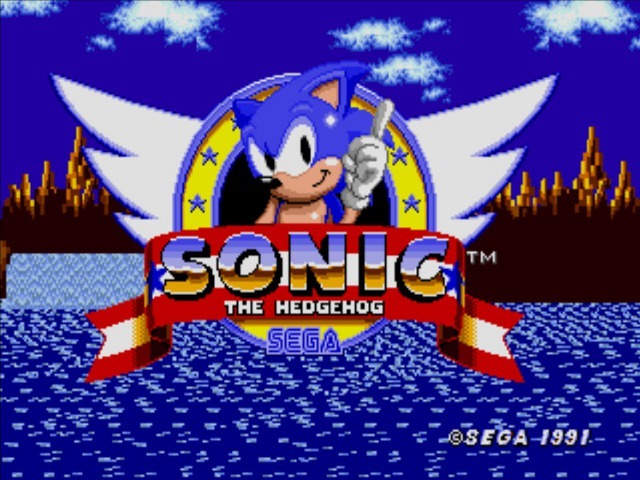 The in-game messages in Sonic 2 even features both names, which can be toggled between by imputting a little-known code on the title screen (↑↑↑↓↓↓↑). Personally, I'm happy that Miles retained his name; it adds to the little fox's charm. And charm is something that he has plenty of. The little guy's dogged determination and open admiration of Sonic, as well as his cute expressions, made him a very popular character. The fox's popularity was particularly welcome in Japan; Sega implied in the Sonic Mega Collection that Tails's presence helped the series's popularity with Japanese audiences. Tails stands alongside a small handful of other characters such as Pit, Rock, Kirby, and the Boy and his Blob as a prime example of idealism and innocence as a winning character type. Tails quickly became my favorite Sonic character (as well as one of my favorite characters, period), and remained so even as the roster of Sonic characters spun out of control. In the United States, Sonic's popularity, already high after the first game, exploded after the second title's release. Suddenly, there were Sonic shirts and board games, Sonic comics and cartoons. The latter two products are particularly notable: as the Sonic character roster at the time consisted of little more than Sonic, Tails, and Dr. Robotnik, Archie and DiC took it upon themselves to add a number of other characters to the mix. The resultant cast took on a life of its own, particularly in the Comic series which continues even now. The two animated programs gave American audiences the chance to hear Sonic and company speak. The shows cast voice talent like Jaleel White, Christine Cavanaugh, and Kath Soucie, so they were well done indeed. My favorite aspect of the shows was the fact that Tails was voiced by a boy, rather than by a woman, which I felt lent some genuineness to the character. Of the two cartoon shows, the more serious Saturday morning offering proved to be the most popular, but I was much more fond of the brighter weekday fare. This was not only because I could never seem to find the Saturday show in the listings, but also because the weekday production featured Tails in a much more prominent role, even if that role was generally to be pulled out of tough situations by Sonic. Tails's relative helplessness was probably due to the stateside press materials' initially listing the fox's age as four-and-a-half (in Japan, Tails has been eight years old since his conception). While Sonic 2 made its mark on the media, I had few opportunities to play the actual game. 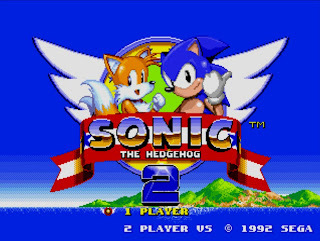 My first hands-on experience with Sonic 2 was at a party my mother brought me to; it was held in a lovely white house on a cul-de-sac. Though I cannot recall whose house it was or what the party was for, I do know that they had a Sega Genesis in the basement, with Sonic 2 plugged in and running. 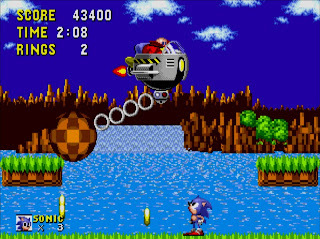 Sonic 2 took everything that the first game was and improved upon it—it's no wonder that the game has become a benchmark title for the series. The music was, once again, top notch; the graphics were gorgeous, particularly in the Aquatic Ruin Zone and Casino Night Zone, and, most notably, Sonic now had Tails to follow him around. One of the best things about the game was that Tails could be controlled by a second player, allowing two people to play the game together. I, naturally, always insisted on holding the second controller. When I play the game myself, it's always a toss-up between playing Tails alone or simply having him tag along after Sonic, since having the fox go solo also became an option. Playing as Sonic had its definite advantage, however: in Sonic 2, collecting all seven of the game's hidden chaos emeralds not only allowed the player to see the game's good ending, it also allowed Sonic to transform into Super Sonic, a Super-Saiyan-style floating yellow powerhouse. I never had the opportunity to play the game enough to reach that point, however. Even so, I leapt at the opportunity to buy the book to the game, Sega's Official Player's Guide to Sonic The Hedgehog 1&2. Published by Sega itself, the guide features walkthroughs to Sonic 1 & 2 on both the Sega Genesis and on the Game Gear, essentially covering four games at once. It even opens with the first story of the Archie Comics series, shows a frame-by-frame transformation sequence for Super Sonic near the end (how I originally discovered Super Sonic, by the way), and ends with a catalog of Sonic Goods, complete with order form. The guide has somehow survived years of close reading intact, and I treasured it even when I could not play any of the games it featured. One other treasured item that I managed to get my hands on was a Sonic The Hedgehog doll. I kept that stuffed animal in my bed long after I gave up on the others. It's true that a middle school boy sleeping with a stuffed animal is unusual, but I didn't care. This was Sonic, after all. 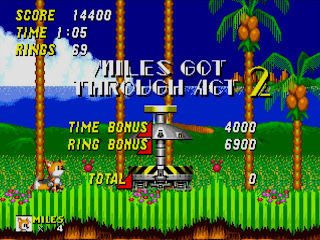 In the times that I did have the chance to actually play Sonic 2, for the most part I contented myself with Tails, following along after Sonic and helping to grab rings and fight enemies. The fox was fun to use, but while he would chase Sonic down after losing track of him by spinning his tails like a propeller, there was no way to manually make him fly. That, however, was soon to change. The Sega Game Gear was an ill-fated portable system. Bulky, heavy, battery-hungry, and expensive, the machine was too unwieldy to justify its having a color display and decent processing power. It did, however, have its share of decent games. I never owned a Game Gear, nor did I want one. My friend, however, did have one, and he was good enough to lend me the system along with Sonic Chaos for one evening. Sonic Chaos was known as Sonic & Tails in Japan, and the name is appropriate: the game gives the little fox a good deal of attention. Fun, but difficult to control, Sonic & Tails was nonetheless notable for one reason: it was the first game in which the player could direct Tails to fly. I wasn't about to pass that up; and I played the game from start to finish with Tails in the one evening that the Game Gear stayed at my house. Furthermore, the game was much more fun to play than to watch, which made its single-player gameplay less than ideal for time with friends. What I did love about the game, however, was its animated opening sequence, which had actions scenes that struck my as far more engaging than anything that the American animated cartoons had offered. Sonic's design was simultaneously sleek and cute, as well. To top it all off, Spencer Nilsen's Sonic Boom was a spectacular piece of music. I drove my friend crazy with all my requests for him to put the game in just so that I could watch the opening. Then came September of 1993. Sonic The Hedgehog had just landed on the airwaves, and I had just landed in the middle of a new school. Though I did not play much of the early Sonic games, the hedgehog was about to become a centerpiece of my life.